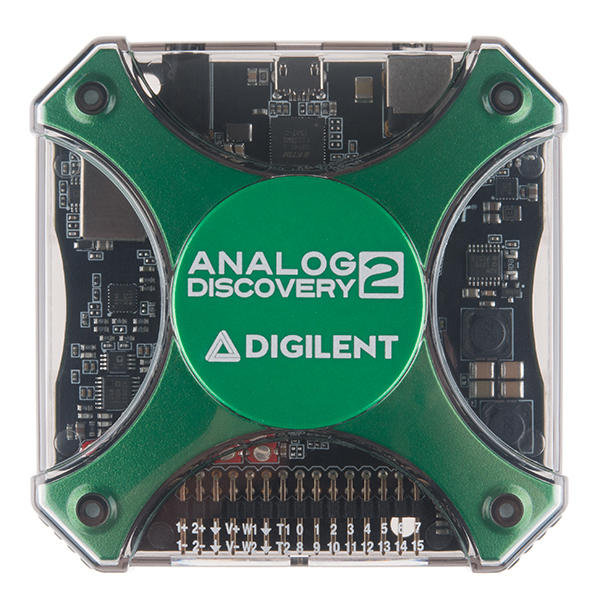 The Digilent Analog Discovery 2 is a USB oscilloscope and multi-function instrument that allows users to measure, visualize, generate, record, and control mixed-signal circuits of all kinds. 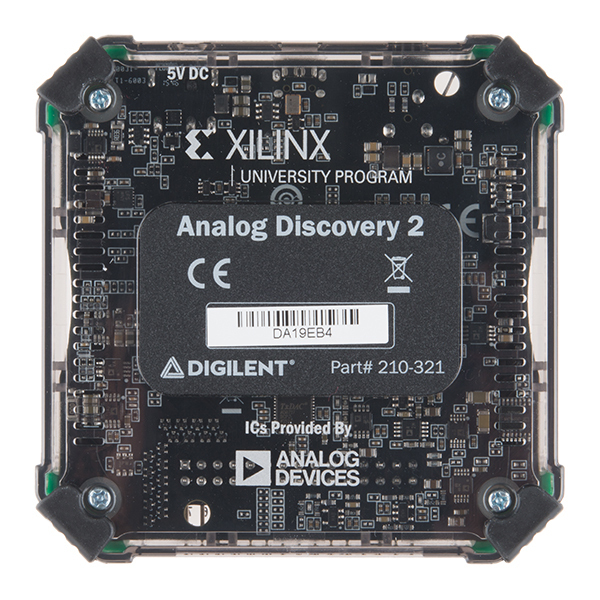 Developed in conjunction with Analog Devices and supported by Xilinx University Program, the Analog Discovery 2 is small enough to fit in your pocket, but powerful enough to replace a stack of lab equipment, providing engineering students, hobbyists, and electronics enthusiasts the freedom to work with analog and digital circuits in virtually any environment, in or out of the lab. The analog and digital inputs and outputs can be connected to a circuit using simple wire probes to connect and utilize the inputs and outputs. Driven by the free WaveForms 2015 (Mac, Linux and Windows Compatible) software, Analog Discovery 2 can be configured to work as any one of several traditional instruments. 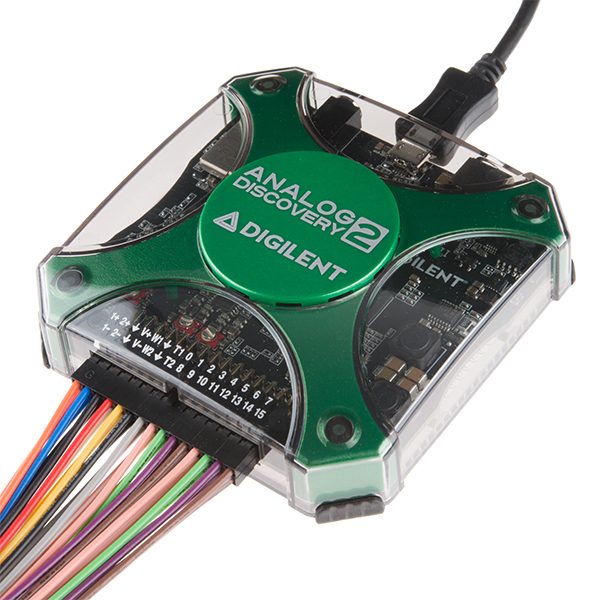 If you would like to attach BNC probes to your Digilent Analog Discovery 2, we have the Digilent BNC Adapter Board available for you to utilize! Not showing up even after software and drivers are installed? If you are on a Mac and have installed the Waveforms 2015 software and FTDI drivers are fine, but the software doesn't recognize the device ("device not detected"), you need to unplug the Analog Discovery 2, restart the computer, open the Waveforms 2015 software, and plug the device back in. This fixes the issue most of the time. 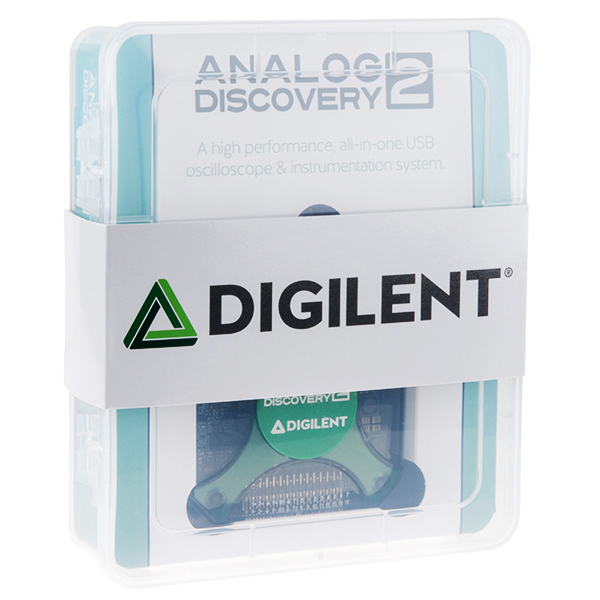 Just an FYI this product is $179 from Digilent once you register an account and verify it with your school email. I'm a student so every penny counts! I'm not a student, I just pay for their educations. Not only am I paying directly through tuition payments, but there's also my property taxes which pay for K-12 for everyone in my county as well as my state and federal taxes which pay for universities throughout this nation. I'm not still living off my parents with subsidized health care and since I'm over 18 I'm actually responsible for my debts. So every penny counts for me, too, but Digilent will only sell to me at the same price as Sparkfun. Enjoy it while you can, kid. The Real World's gonna get you soon! Mine should arrive today. Looking forward to it. 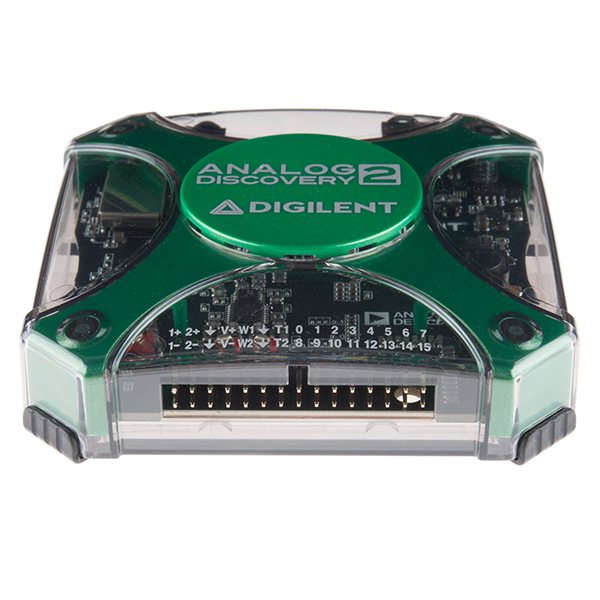 The logic analyzer is listed under the 3.3V peripheral section; are the inputs 5V tolerant? Section 5. of the datasheet page "Input and output pins are LVCMOS3V3. Inputs are 5V tolerant. Overvoltage up to Â±20V is supported." 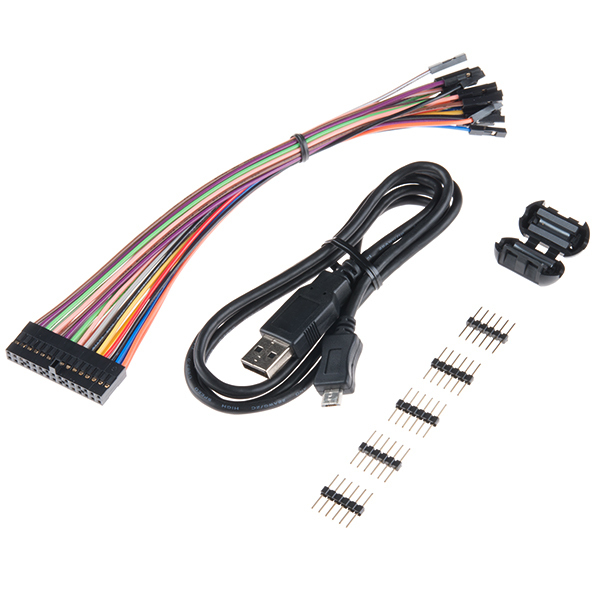 Anyone have any hands-on experience with this and the lower-end BitScopes (Mini/10 and Micro)? Would be very interested in a compare/contrast on the hardware and software. Post the problems you are having on the Digilent forums. I hear the developer is on the scopes and instruments section so you'll get the best help there. hi can this be used as sound card? to send out digital audio signals from my computer via USB and turns into -5V~+5V signals? I'm not really sure. It looks like you could upload small .wav files to play it through the wavegen on the software, but it doesn't seem that you can send a stream of data from your computer. Perhaps that's something that can be done with the scripting? Please confirm: do I need power supply to operate? What do you offer? You only need a USB cable (included) to use the device. If you want to drive more current from the digital output pins (up to 700mA total), then you'll need a wall supply like this one. I was excited to see this until 1) saw the price and 2) Windows ONLY software? Yea, No. Would this be suitable for HF Amateur radio applications? It'll work, but you'll be pushing the device at the upper end of your HF spectrum (30 MHz). Keep in mind that the scope will see a -3 dB attenuation at 30 MHz, so your readings will be a bit off. To even work in the 10MHz - 30MHz range, you'll need Digilent's BNC adapter and real scope probes. The included wire harness won't really work above 9 MHz. Looks awesome! I look forward to having my own one day. 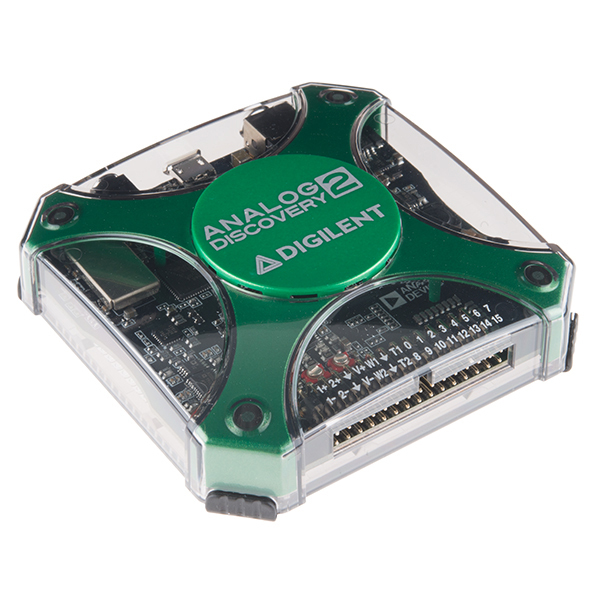 Is the Labview Home bundle version of Labview compatible with the Analog Discovery 2? Seriously guys? You don't even carry the BNC breakout board, and you've added $100 to the price?! What the hell? It's not really fair to compare a student-only price to this. You have to go through a pretty in depth academic verification to get that price + sign off that you are willing to be contacted regularly by Digilent. 279 is a pretty good price for the features/specs and in comparison to what else is out there. We'll definitely look into it. Right now we're seeing if this will sell, if it sells well we'll look into add-ons. It's almost $400CDN... that's just mental considering it's $179USD on Digilent's website. It shows as $279.00 for me. You can't compare to the student price. I guess SparkFun did add 95 cents. Part of what you're paying for is the software that makes the hardware run. A lot of work goes into making the software easy to use and feature rich. Nope. An MCU doesn't include dual 100 MHz DACs and ADCs. Those parts aren't cheap. Perhaps the most directly comparable competitor is Red Pitaya. But it doesn't have the overvoltage-tolerant I/O pins that this does - it would need an accessory board to make it suitable for use as a general purpose logic analyzer. I hope you are only trolling or didn't read the specs. Analog Discoveries (both the old one and this one) are fairly serious all-in-one lab instruments. Here you are getting a mixed signal oscilloscope and arbitrary signal generator + logic analyzer. 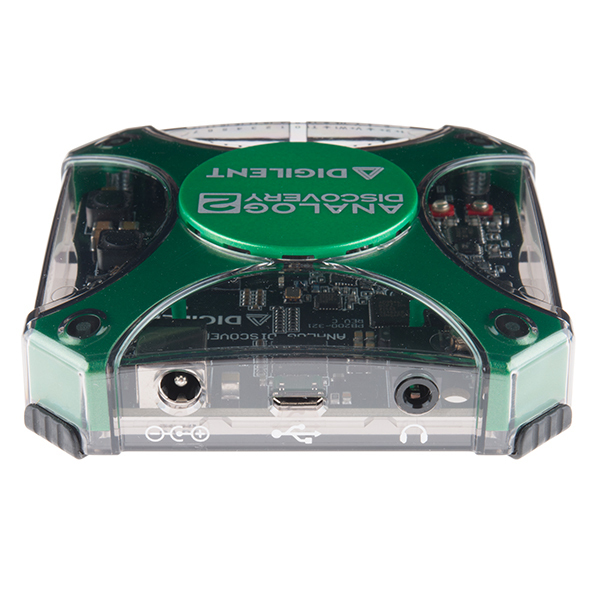 This thing runs circles around most of the USB "oscilloscopes" on the market. Good luck trying to achieve any of that with a $3 micro. Red Pitaya is perhaps a bit more powerful in terms of the raw hw, but the Analog Discovery has much better software and support. 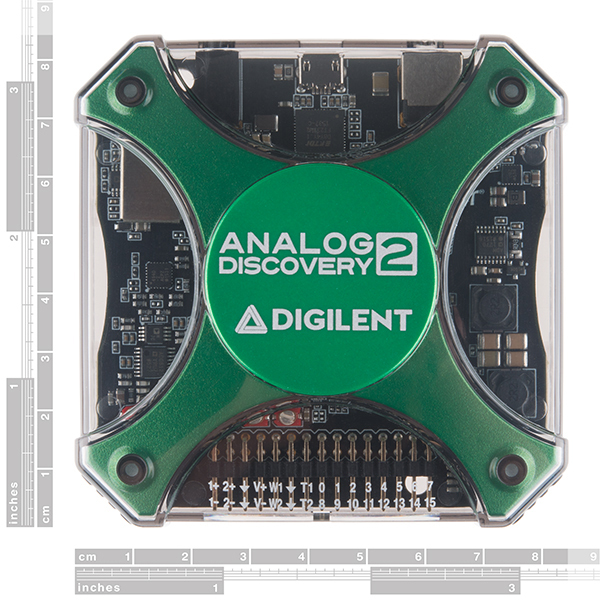 If you want an instrument instead of a dev board, the Discovery is a lot better deal. False. A $3 MCU will not do most of the things on this feature list. You could do a few of the things on the list, but not most of them. Why would it being open source make it magically cheaper? Fast, precision measurements cost money. If it's so easy and cheap, where's your replacement? I see a lot of oscilloscopes every day at work in the semiconductor industry. This is really a good solution for home or on the road when you need to capture a couple of plots. This would even cover 80% of what I typically capture at work. Two channels only you say? Sure, channels are like free beer; we could always use more. But don't stick up your nose at this little beauty, learn to capture only what you really need. All the software configuration is easy and the fact that it runs on my Mac is huge benefit. I actually haven't had a chance to use it much. But I did use it to verify the output of a serial port for a python driver I was working on for a half-cube oven. I allowed me to confirm what was coming out of the port in response to my software commands. This meant that when I actually tried my code out on the oven itself, the code worked first time. This guy works much better than my bitscope. Don't get me wrong, my dual channel bitscope has got me through some binds, but every once in a while it acts glitchy. Sw crashes etc. It gets frustrating. I haven't been seeing any of that sort of thing with the diligent gear. Pricy but worth it. Very versatile. Software is easy to get and install, had it up and running in literally minutes. I really like the software. It just works. Not the fastest scope or logic analyzer but good enough for most jobs. I have recommended it to several others. Wow, very impressed. Portable, reasonable SW and includes SW for a spectrum analyzer, oscilloscope, etc etc. Can re-calibrate anytime which is re-assuring. I have a Saleae Pro 16 channel and its really cool but this is great addition. Not as solid as the Saleae in a plastic case but the price makes up for this weakness. The js programming capability is a real plus too. This appears to be a fairly new product for Diligent, improving upon the Analog Discovery. Getting it up and running was a challenge. It pulls too much startup power for most USB ports, and therefore I had to buy an externally-powered USB hub. The documentation on it is still evolving, although the Diligent forum was very helpful. All that said, I really like the unit, and it does just what it is supposed to do. So I do recommend it. Awesome product, just one small problem running WaveForm software the very first time on macOS. Had a heck of a time detecting the hardware and had to dig through forums looking for a way to get it hooked up. After that though it has worked flawlessly. 100MHz for this price is a major advantage. The only thing I missed was the BNC adapter. It should go together, not as an option, now I am stranded fiddling with cables, adn workarounds. The size is also an absolute plus: a mobile osciloscope + function generator! I absolutely adore this thing! It has everything I could possibly want and so much more. A lot more actually; I wish I was savvy enough to really wring all the potential out of it. Don't go thinking its hard to use - its simple as could be. The fact it works on Linux (and really well, I'm on Ubuntu) is thrilling. I use it everyday for basic oscilloscope duty, function generator, and most often these days for the build in serial protocol analyzer. Without it I would be reduced to debugging an I2C driver through LEDs. It is a godsend, and worth every penny. I have used this a couple times, and my initial impression is that it "just works." I'm using a Mac, and thought I might need to futz with conflicting FTDI drivers, but it worked perfectly when I plugged it in. The controls are intuitive enough that I was able to make it work for me right away. I look forward to using it a lot more, especially for portable project work. Static IO, is super useful as appose to connecting a bunch of LED and buttons / switches to a microcontroller. Protocol, is a great way to connect to I2C or SPI sensors to get started before dealing with the code in a microcontroller or raspberry pi. Network, Messing around with some audio filters and displaying the bode plots. Spectrum, always nice to have. I have never needed to use the âScripâ capability; I wish someone would make a quick intro on how to use it.